There have been many improvements in the bathroom equipment in the last decade, and companies started coming up with new ideas to make your showers feel and look better. 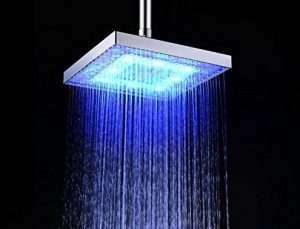 The most popular and the best one in my opinion are the LED Shower heads. They definitely add a beauty to your bathroom and if you like to shower in the dark, then these will be an amazing option for you. 2 Why LED Shower Heads? If you are looking to replace your old rain shower head, then please consider buying a LED shower head, because in my opinion, they are definitely worth it and i would recommend everyone to get one. In this article we are going to go over some of them and check out which one is the best LED shower head for you. Let’s start this list with the Getek Square 8 inch shower head. 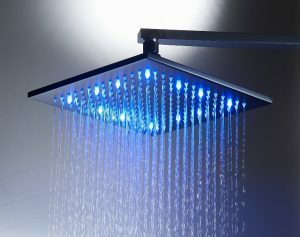 This is a great option for people that do not want to spend much money but still try having a shower under the LED lights. This product has the rainfall feeling, which is very relaxing and will make you want to stay under it for hours. If you want one that has powerful spraying, then this one is not the correct option for you. The LED Lights in this one are great and quality. Some shower heads have LED’s but they are hardly noticeable, but the Getek Square’s lights are very bright. It has 3 colors, which change based on the water’s temperature, so for example, if the water is too hot the color will be red, if it’s blue it means it’s too cold and so on. Getek claims that the LED’s have ~6000 hours of life, and to be honest, that’s much more than the other shower heads in this price range. The Getek Square will fit any bathroom because it looks very modern and beautiful. The only thing I don’t like about this product is that you can’t choose the LED light because it always changes based on the temperature. Don’t get me wrong, all the colors are very relaxing and good. Installation is very easy and does not require any ‘extreme’ tools to install it. You can follow our tutorial on how to install a shower head if you’ve never installed one before. At number 4 of our best LED shower heads, we have the Luminex by PowerSpa, which is a very affordable and beautiful shower head. The only thing that i don’t like about it is that it’s handheld. I personally don’t like handheld shower heads but if you have no problem with that and want to try a LED shower head, then you should take a deeper look into the Luminex by Powerspa. 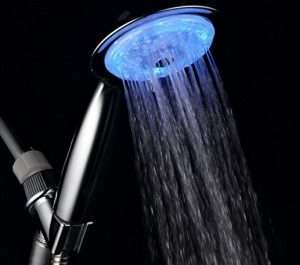 Most of other shower heads have 3 LED colors, but this one has 7 of them which change automatically every few seconds. What i liked about the Luminex is that the LED’s are powered by running water, so you don’t have to change the batteries or replace them anytime soon. That might be a good thing for some people, but some people might hate it because there is no way to turn the LED’s off unless you turn off the water. Because of the fast changing colors, i would say that this shower head is a perfect choice if you have kids, because i guarantee you they will love it. It has 4 different spraying settings which are Rain, Massage and a mix between them. Another thing not many of shower heads have is the ‘water-saving economy’ option. What this option does is it doesn’t waste unnecessary water. The installation is also very easy and you don’t need to be an expert to do it. You can follow the instructions it comes with and you should be able to install it successfully. Overall i would say it’s a great option because it’s extremely cheap for the things it has to offer, because other products in this price range are very bad compared to the Luminex. This is one of my favorite shower heads, because it offers a lot of quality for a low price. The LED lights on this are stunning and i think that every house should own one. These LED lights are similar to the Luminex ones, but they are a bit stronger and brighter. They are powered by running water too, which means you don’t need to charge the batteries or anything. 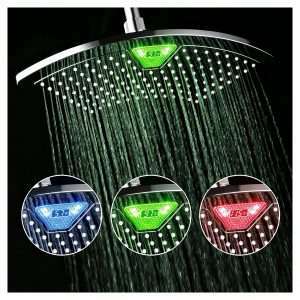 The LED’s on this shower head change based on the water temperature, where blue is for cold, green is for warm and red is for hot. DreamSpa claims that their LED lights are very quiet compared to other products, and our tests confirmed that. You can also choose different spraying settings based on your mood. There is a strong and weaker setting which is connected to the LEDs, so if the water pressure increases then the lights will get stronger too. This is something that is uncommon on most of the shower heads. It basically has everything you would want from a shower head, but please be aware that this does not come with a hose too, so you have to purchase these separately. You can attach this shower head to an old hose if you have one, and that should solve the problem. The Rozin is my favorite because it looks really luxurious and the LED colors on this one are stunning, especially on the 20 inch one. It’s a good option if you have a huge bathroom and want to turn it into a very fun place. The plate is very thin which was surprising, because standing under it feels like you are under a waterfall, which of course, is an amazing feeling. If you decide to purchase this product, please be careful while installing it, because if you don’t install it correctly the water won’t flow as it should. So make sure to keep it in a straight position so the water can fall like it should. If you are looking to get a small shower head (8 or 10 inch), then i would suggest you to go with another shower head, because this one is only good if you purchase the bigger versions. You can find a higher quality ones for lower prices for the small sizes. To finish up our best led shower head list, we have the AquaFaucet shower head, which hit the market not too long ago and won the heart of many costumers with it’s high quality and reliability. This product is completely made of stainless steel, which is a very quality material which won’t get rusty after a few months of use. Also, I like the design of it a lot, and it doesn’t feel like it’s made of cheap material. If you have a bathroom which has a darker color background then this would be a perfect option for you. 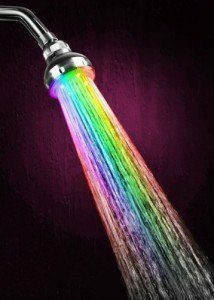 Like most of the shower heads in this list, the colors change according to the water temperature, so the Blue, Purple and Red colors where Blue is for cold, Purple is for warm and red is for hot. If the water gets too hot, the lights will start flashing to warn you, which is a good thing if you have kids. If you are planning to renew your bathroom equipment, then this shower head is a MUST for you, especially if your bathroom is large and has a lot of space. You won’t regret getting this shower head because it really makes you bathroom feel luxurious and clean. I would like to say that AquaFaucet definitely deserves the number 1 on this list because it has everything that you could want from a shower head. You might ask, why should I buy a led shower head instead of a normal one? Well, in the end, it all depends on personal preference, but I would personally say that LED shower heads are the best inventions for bathrooms in the last decade. LED Shower heads look amazing in every aspect. If you’ve never seen a LED shower head with your eyes before, just imagine turning off the lights in your bathroom and taking a shower under a LED light. You really get a unique experience from it, and you will want to take a shower twice or thrice a day because of that. If you have kids, you probably know that they hate to take showers, and you have to waste hours to talk them into it. 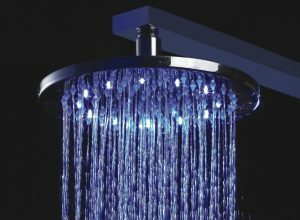 LED showers will turn their shower time into their best time of the day. Kids are amazed by this kind of things. You will have another problem now though… they will want to take a shower very often. If you are someone that likes to welcome family members or other guests to your house, then a LED shower head will probably raise their eyebrows and make them wonder where and how you got it. 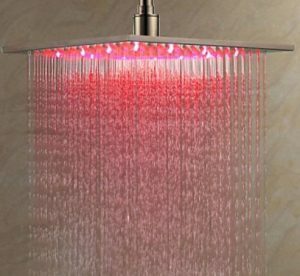 LED Showers usually look much more expensive than they really are. Before taking a look at this article, you probably thought the same too, didn’t you? They give your bathroom a very luxurious look and make it look more expensive than it really is, so that’s a nice life hack. The price of LED shower heads and normal shower heads are similar, so instead of going for a normal one, I would personally go for a LED shower head because you hit two birds with one stone, and if you don’t like the lights, you can buy one that has removable LEDs. If you came this far, I would firstly like to thank you for reading the whole article, and I hope i made your mind up to purchase a LED shower head because i personally think that they have a lot of benefits. If you decided to purchase one and want to leave a review about any of the products we listed above, you’re welcome to leave your personal review in the comments box below.